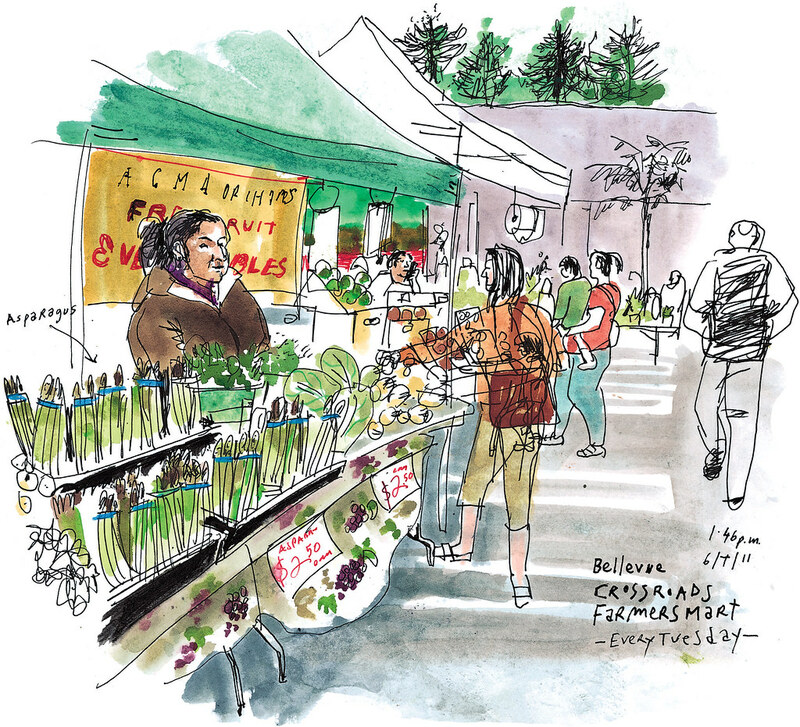 Sketched June 7, 1:46 p.m.
With the summer solstice around the corner, seasonal farmers markets are back with colorful fresh produce you can buy directly from the growers. “What sells the most now are asparagus, lettuce, garlic and onions,” said Ramona Lopez, a farmer from the Yakima Valley I met this week at Crossroads Farmers Market in Bellevue. Also in Lopez’s stall: bok choy, parsley, cilantro and dill. Coming next week: sugar snap peas. Expect cherries later in June and apricots, plums, watermelons and tomatoes in July. Lopez, 44, and her son Rafael, 20, put in 18-hour days to bring the crops from their family-operated, 30-acre farmland in Sunnyside. Until September, you can find them in Bellevue on Tuesdays, Burien on Thursdays, Federal Way and Kent on Saturdays, and Renton on Sundays. I’m looking forward to trying the bundle of asparagus I bought for $2.50. Lopez said it tastes great steamed, with barbecue sauce, or just fried in the pan with a little bit of butter. Find a list and map of farmers markets at wafarmersmarkets.com. A farmers market wouldn’t be the same without the live folksy music that takes your mind right to the fields. 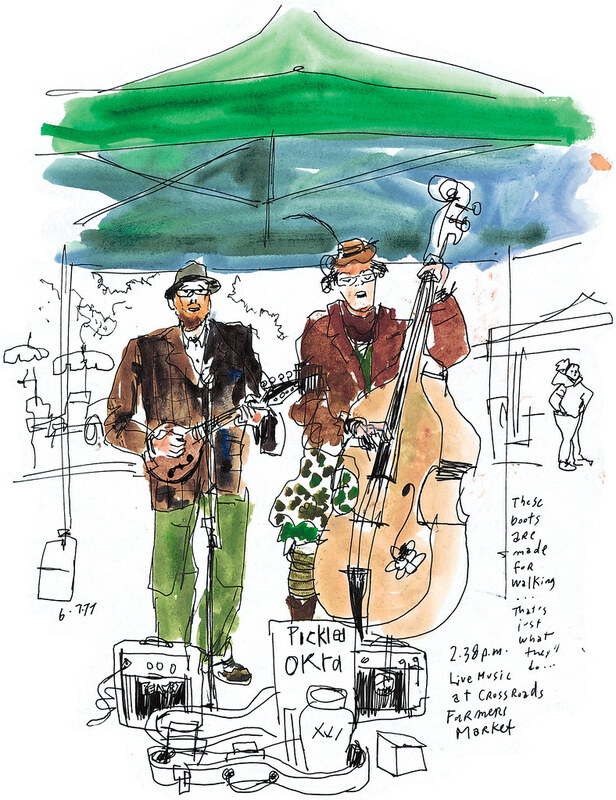 At Crossroads I sat to listen to the Southern-style tunes of Pickled Okra. Sketched June 7, 2:38 p.m.
Coming up: My once-a-month exploration of Seattle-area communities following your recommendations is coming up. Where should I go? Send me your suggestions via e-mail, Facebook or Twitter. Have a great weekend!